Cadence® PSpice® Advanced Analysis Option is a circuit simulation software which enables engineers to create virtual prototypes of designs and maximize circuit performance. It combines Sensitivity, Monte Carlo, Smoke (stress) analysis, Parametric analysis and an Optimizer to provide an expanded environment to take design analysis beyond simulation. Used in conjunction with the core PSpice simulation engine the PSpice® Advanced Analysis Option maximizes design performance, yield, cost-effectiveness and reliability. The design might work correctly in the "lab," but can we go to production with it? ◦ Over manufacturing tolerance variations? ◦ Outside of temperature range? ◦ Over its full operating range? • Are the individual components being over-stressed? • Will it fail in test or in the field? • Are there critical sensitivities that will cause problems in the future? • Which components will most likely fail during manufacturing? • Go beyond just debugging waveforms—use PSpice@ Advanced Analysis Option to help you optimize your design, improve your design reliability and manufacturing yield and reduce the cost of components. Analog Circuit Optimizer analyzes analog circuits and systems, fine-tuning designs faster than trial-and-error bench testing. It helps find the best component values to meet performance goals and constraints. Efficient time management on final optimizations. Optimizing to a set of goal functions and/or a set of curves. The Sensitivity Analysis identifies which component parameters are critical to the design goals of circuit performance. By analyzing the behavior of components for the entire circuit, it evaluates yield versus cost tradeoffs, thereby maximizing cost-effectiveness. Identifying the sensitive components within the circuit, then export the components to Optimizer to fine-tune the circuit behavior. Estimating worst-case performance of the circuit given the device tolerances. Identifying which components affect yield the most, then tighten tolerances of sensitive components and loosen tolerances of non-sensitive components. 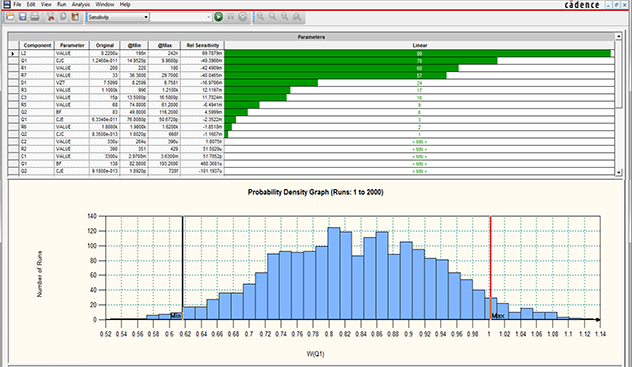 Enhanced PSpice® Advanced Analysis flow provides the ablity to efficiently add global tolerances and distributions. View the demo video on sensitivity analysis with the enhanced PSpice Advanced Analysis flow capabilities. Click here. The Monte Carlo Analysis predicts the behavior of a circuit statistically when part values are varied within their tolerance range. Monte Carlo also calculates yield, which can be used for mass manufacturing predictions. Displaying results in a cumulative distribution graph. View the Demo Video on Monte Carlo. The Stress Test Analysis warns of component stress due to power dissipation, increases in junction temperature, secondary breakdowns, or violations of voltage/current limits which over time causes circuit failure. Stress test helps in identifying problems and preventing circuit failure. The Parametric Plotter enables sweeping of multiple parameters after creation of circuit simulation and provides analysis of sweep results and feasibility to sweep any number of design and model parameters (in any combination). Learn how PSpice® Advanced Analysis improves engineering productivity and optimizes electronic circuits. In this Chalk Talk episode from EE journal, John Carney from Cadence provides an overview of the PSpice mixed-signal mode simulation engine towards IoT device applications. Watch the video to learn how you can simulate a design with existing hardware. The PSpice® Advanced Analysis Smoke feature provides analytical data that can be utilized to measure the stress level of components due to excessive power dissipation, excessive increase in junction temperatures, overvoltage and overcurrent limits. This video will show you a Monte Carlo analysis and it's impact on the manufacturing yield of a design by varying the component temperature parameters. Curve-fitting can be used in cases where performance is best described as a waveform or is not measurable in terms of a function or a value, such as in wave shaping circuits. Watch our on demand webinar on PSpice Technology to learn about new PSpice features and functions including PSpice® Advanced Analysis capabilities. OrCAD®/PSpice® Lite software will let you experience all the features and functionalities of the actual software. Download now and discover how easy it is to use the state-of-the-art PSpice technologies. Find an OrCAD Channel Partner!